About Egyptian cotton which is the BEST fabric to use for Sheets and fine frocks. though women's hands bleed to pick it. BUY IT AND DYE IT! If you want to see, handle, touch the finest of cottons, go to MOBACO a retail cotton only boutique in Cairo. They have three stores in PARIS. You know they are good if they can do that! They handle this Caviar Cotton and you can see and feel it there. If you go online, you can google RITZ TOWELS EGYPTIAN COTTON and see the RITZ factory. These are fabulous towels, the set is usually 15$ But RITZ itself has no net presence. Once you feel a RITZ TOWEL you will recognize it as something that has been imported for 80 years. Everybody's grandma had a few in her kitchen. Now they're on EBAY and AMAZON! Egyptian cotton is hand picked (see above photo) which guarantees the highest levels of purity. In addition, hand picking puts no stress on the fibers - as opposed to mechanical picking - leaving the fibers straight and intact. All these factors have resulted in the Egyptian cotton being by far the best cotton in the world. Fabrics made of Egyptian Cotton are softer, finer and last longer than any other cotton in the world. The "hand" or feel of the sheets created from Egyptian grown cotton is a bit harder than other cottons when the bedding is new. However, with every single laundering, the cotton sheets from Egyptian fibers become softer and softer. Like a fine wine, age improves the Egyptian fiber cotton bedding and, unlike many products, you will prize your Egyptian fiber sheets of cotton more and more as they age and become soft and cuddly.Just turn the paddle on washer to gentle, and wash one sheet at a time. THE EGYPTIAN COTTON STORE in LONDON says: "Recognize quality. Selecting the finest quality bed linen can be confusing amid so many claims of thread counts and finishes. The Egyptian Cotton Store understands cotton and the secret to detecting what is the best. Of course thread count is important but when choosing the finest there are other considerations, such as the quality of the cotton itself, the feel of the fabric against your skin, and the design. NOTE: Their plain white flat sheet, 400 thread count, in a super king size is 51 pounds sterling (!) for a 6 foot by 6 foot square sheet, so it doesn't make sense to buy cotton from them, but it makes sense to find cotton factories in Egypt that can give you that thread count and a fine Egyptian cotton yardage! And you get to see the Cairo Museum & the pyramids! The thread count is the number of threads in a square inch of fabric. This is achieved by measuring the number of threads in the Warp (length) and the weft (width). The most popular cottons will be around 150, while good quality sheets will start at 180. Anything above 200 brings you into the luxury range. The thread count is also influenced by the construction and quality of the yarn used. With finer threads, such as Egyptian Cotton, more threads can be woven into a square inch, which produces a finer fabric. It is well to be wary of marketing claims of very high thread counts, sometimes up to 1000. These claims are made by twisting fine gossamer threads to achieve the high numbers for customers who may, understandably, buy on thread count alone. Like anything else, the finest quality can only truly be achieved when made from the finest quality materials. The quality of the cotton depends on the length of the fibres, known as staples. The longer the staple - the better the cotton. The cotton is then carded to remove dirt and short fibres. However a process called combing is far more meticulous and will remove up to 15% of the fibres. This combing process, used by The Egyptian Cotton Store, will leave only the longest staples, ready for spinning and weaving into the strongest and finest fabric. The result is a fabric which is softer and more sumptuous than any other. The Egyptian Cotton Store uses only 100% long staple Egyptian cotton, which is indisputably the finest quality in the world. More than that, we only use cotton, grown on the Nile Delta. 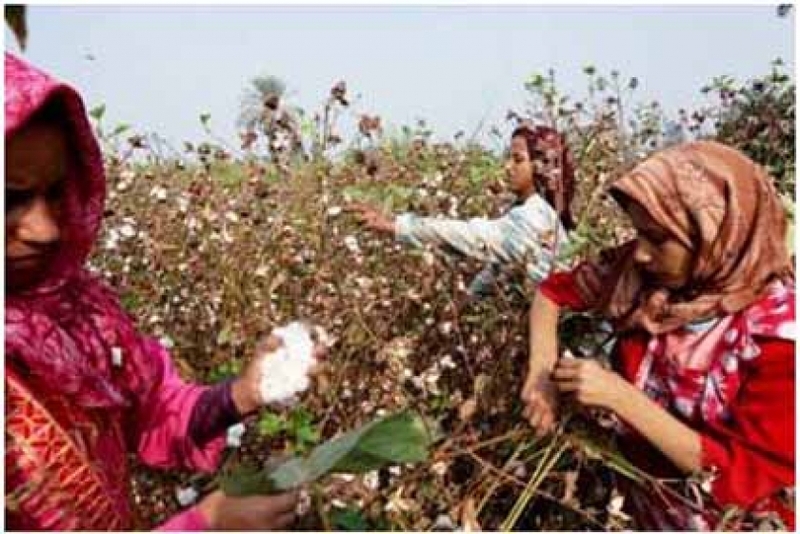 This is because today “Egyptian” cotton is produced in other countries, and although it complies with the standards, it does not have the same growing conditions and is often harvested mechanically. Egyptian cotton from the Nile Delta is hand picked which guarantees purity and puts no stress on the fibres. And finally….The Design --After so much care in ensuring we obtain the finest fabric, we must do justice in the design. Our London based design team; know just how to combine the practical with fashion. Practical; in making sure that fitted sheets fit the larger mattress but also have a superb fit for all; valances that look tailor made whether you have a divan or a foot board; Duvet Covers that do not allow the Duvet to “peep” through; Flat Sheets with deep double-cuffs that will “show off” over the bulkiest of duvets, blankets or throws, and lets not forget the humble pillowcase with extra deep shams, generous flaps to keep your pillow in place and of course comfort for the head and face. The fashion statement from our designers is “Sophistication with Charm”. English designers have been renowned down the centuries for their ability to embody sophistication and class. That is the course set and continued by our English designers. THEIR EMPEROR SIZE SHEET is big enough for a dress factory to make 2 frocks. I would recommend some good DYE if their colors don't move you. And then biggest CAIRO retailer: MOBACO in EGYPT --hundreds of stores in that country. Write SALES @ mobaco.com and ask how much to ship you a king size white sheet. Then google "HOW TO TIE DYE WHITE COTTON" That is my humble instruction but read TIE DYE MASTER, PAULA BURCH who wrote the ENCYLOPAEDIA, the whole TIE-DYE course, FREE ONLINE. She uses the master dyes, PROCION.